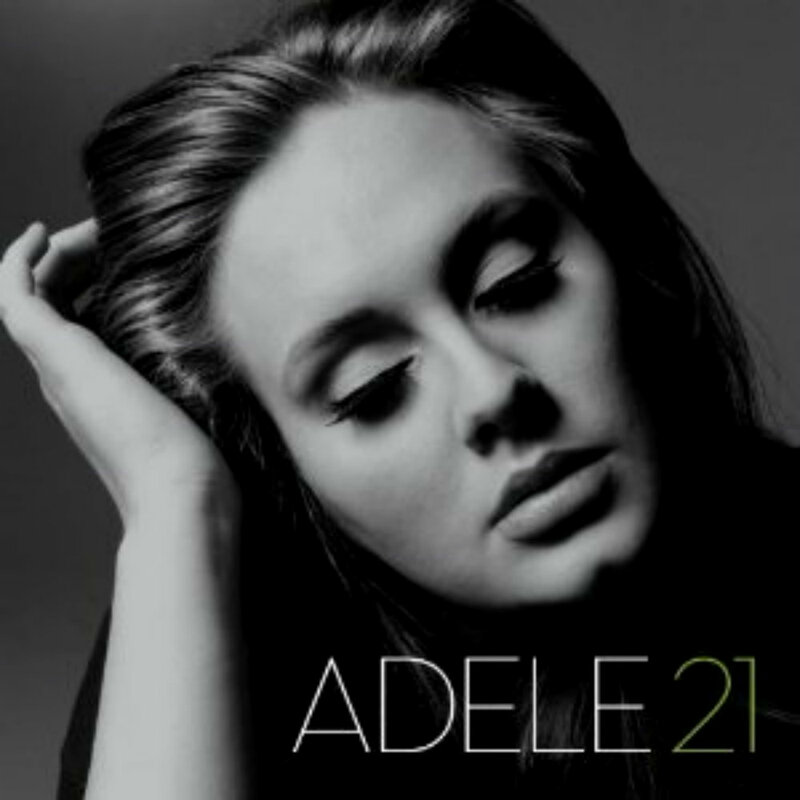 According to iTunes, Adele's 21 was the best selling album of 2012 so what better way to round out the last Music Monday of the year than reviewing the most popular collection of songs from the last 12 months. Released in early 2011, the album 21 is arguably the best music we've been treated to in quite a while (evidenced by the fact it's still relevant and doing well on the charts heading into 2013). Plus Adele won six - SIX! - Grammy's for this album alone. Amazing. Every song is vocally flawless. Adele has a way to make you feel every note she delivers whether she's humming along with the background or slipping into a high note or throwing around that trademark squeak of hers to break up the melody. Her phrasing has become her signature and separates her from the rest of the current vocalists. She's a genius. Her first CD was great. This CD was even better. I cannot wait to hear the next one. It's obvious this album was born from heartbreak and while sad, sometimes pain morphs itself into the best form of art. Especially music. Just ask Alanis Morissette. However, love can also reveal itself in song form and since Adele has experienced the purest form of love by having a baby in the last year... her next album may just top this one. From the infamous Rolling In The Deep to the infectious claps of Rumour Has It to the passion of Set Fire To The Rain and the raw desire in Someone Like You, Adele is able to do what many other artists fail so miserably at... and that is to make you hang on every inflection, on every note and then have you beg for more. Adele's voice is incredible! If you don't have this album yet, what are you waiting for? The ball to drop? Get it. Seriously though, she's perfect for our family and such a blessing in so many ways. Among those is the fact she's so well behaved (for now... most of the time). We were doing some last minute Christmas shopping in the mall before the big day and decided to grab a bite to eat at the food court. Before we left, two older ladies stopped by our table to let us know they couldn't help but see us from where they were sitting and had never witnessed such a well mannered toddler before. Completely out of the blue! It's little things like a small compliment that make you feel like you're doing something right. Let's be honest, as parents we're pretty much making it up as we go along with the goal of keeping our little ones safe so it's nice to hear positive feedback once in a while. Since Madison has been a good girl this year, we asked Santa to be good in return. 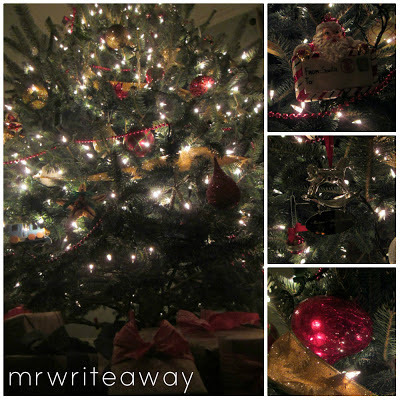 And since mood boards are all the rage these days in blog-world, I figured why not get in on the action... below you'll find some of her favorite gifts from the jolly old man (and us, too) this Christmas. 1. A tweed blazer for a toddler? We couldn't pass it up and she actually got this as an early gift and wore it to a few holiday parties leading up to Christmas. You can find it here, but get it quick - it's almost gone. 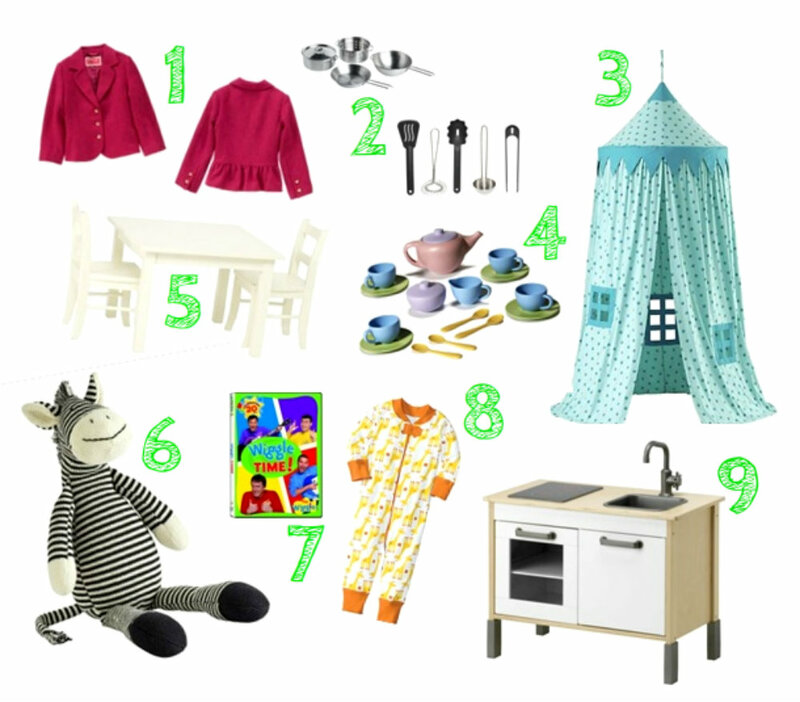 3. Who doesn't enjoy a play house? Especially one with polka dots and window cut outs that hangs from the ceiling! Once we found this, we knew it would be hanging in her room by New Year's. 4. A tea set. Does this need an explanation? It's an Eco-friendly set from here. 5. If you're having tea, then you need a table to set... we found ours here. Sure we probably could have built one, but we're not exactly the most handy people plus we got it on sale. Joy to the world! 6. She has a sock monkey that she sleeps with every night and this zebra is similar in size and construction so we figured she would enjoy him, too. I'm sure he'd like some tea at that table. 7. Madison is mesmerized by The Wiggles so a DVD with their biggest songs was a must have. For the record, I think this show is a little odd... four grown men dancing around and singing songs isn't exactly my idea of a great time. However, it's entertaining and educational and she loves it so my opinion is null. 8. Pajamas from our favorite pajama place... she's in to giraffes lately. 9. A modern, fun kitchen set. This is probably my favorite gift of hers, we knew well in advance that she would be getting one of these for Christmas. Every time we went somewhere that had a play kitchen, she was all about it. We actually have an empty wall off to the side of our kitchen where this will live so we wanted it to be more neutral and not in-your-face primary colors so we opted for the subtle a-kid-cooks-here vibe instead. Does anyone find it hard to decide which gifts Santa brings and which ones you give as parents? We basically decided anything requiring assembly would be given by Santa... so the elves could put it together, of course. Now it's time to go through all of her old toys and donate the ones she no longer plays with - this makes me think of Toy Story 3 every time. Since Christmas is literally right around the corner (the count is less than a week... wow) I'm sure there is some last minute shopping going on. If not, then I'm incredibly jealous of you! The wife and I did pretty well this year shopping in advance and we only have a few gifts left to get; we already know what we're getting, it's just a matter of getting our butts in gear and to the store to purchase them. Figuring out the gift for those folks that have everything is half the battle, am I right? It's easy to get consumed in the gift giving portion of Christmas and become so excited that you found the perfect jacket for your brother-in-law, the one he's been talking about since that windy day in September... but that's not what Christmas is really about. If the jacket is on backorder and not available until mid January then wrap a picture of it and let him know it's on the way. Be grateful that you're able to spend the holidays with your loved ones. Somewhere there are parents unwrapping gifts for children they've lost and Santa is kneeling graveside instead of sliding down chimneys. So please hug those close to you closer and be kind to one another. 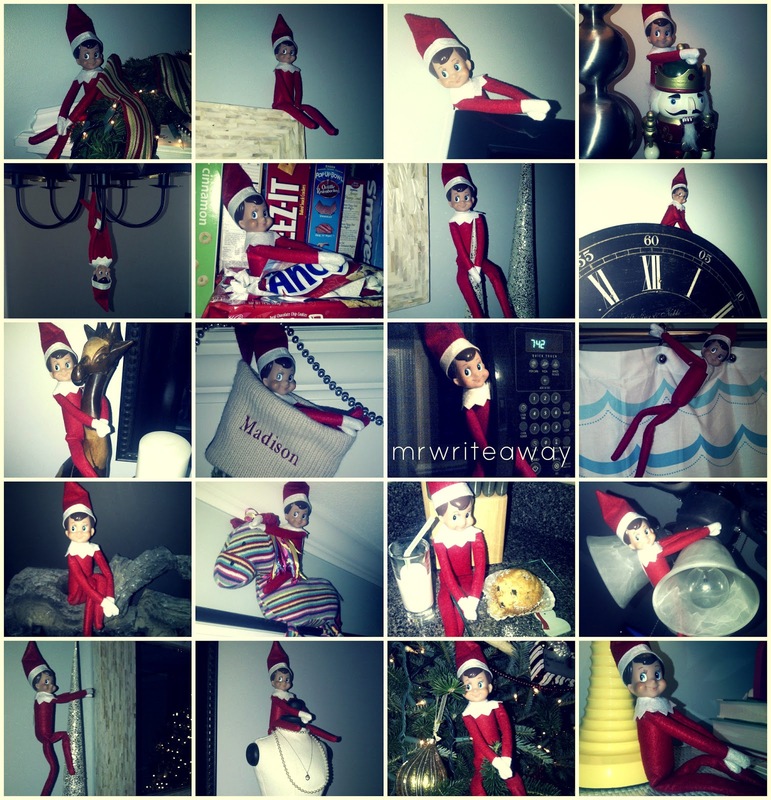 We decided to start a new tradition this year... Elf on the Shelf. It's fun watching Madison roam around the house every morning looking for him. Plus it was nice to say "elf is watching" as incentive for good behavior every time she was on the verge of a tantrum (which isn't very often, but still). 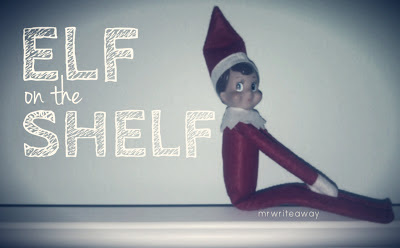 Anyone else out there doing Elf on the Shelf this year? Any ideas? As Christmas approaches, we're finding it hard to keep him moving especially since we're dealing with a toddler so Mr. Elf needs to be at least two feet off the floor. I swear Christmas is more fun as a parent than it ever was as a kid! I would like to extend my condolences to anyone affected by the tragedy in Connecticut on December 14th. The entire community has been in my thoughts and prayers. In a time where the media is focusing on the background of the monster in effort to answer why and to help us understand how anyone could perform such a despicable act, I encourage us to focus more on the memory of those lost and embrace the families and friends of those beautiful children (and adults). I can't begin to comprehend the joy of seeing your child's face in the morning then the heartbreak of the stolen opportunity to tuck them in at night; I definitely squeezed Madison a little tighter when I got home and held on a little longer than normal. My heart breaks for those affected. Sometimes there aren't words adequate enough to express how sorry we are in certain situations, this being one of those times and one of those situations. In times such as these, it seems a hug conveys more than words ever could. Someone I work with hugged a teddy bear tightly when she got home Friday afternoon after hearing the horrible news and has decided to mail that teddy bear to Sandy Hook Elementary school. When a time of the year illuminated by Christmas lights is darkened so quickly, actions like this remind us there is still hope left and encourage us to all focus on the true reason of the season. My wife and I will also be hugging a stuffed animal and before we pass it off to our coworker to include in her package, we'll let Madison wrap her tiny arms around it. Hopefully, parents stripped of the chance to feel their child's embrace will somehow feel the love transmitted from ours. Every year we add a new Christmas album to our collection, last year we added this one, and because of Madison's favorite music of the last year it was a given which CD (yes we still buy CDs from time to time) would be the one to add for this year. 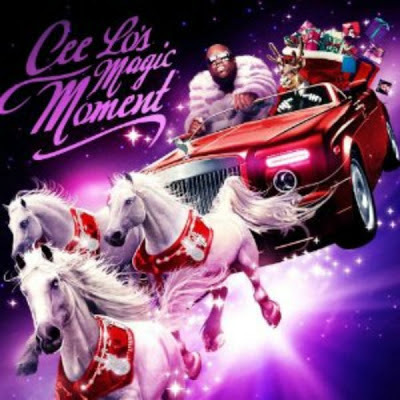 Cee Lo's Magic Moment may not look like your traditional Christmas album, but it surprisingly consists of mainly classic Christmas tunes like This Christmas, The Christmas Song, White Christmas, and Silent Night. There's a nice rendition of Mary, Did You Know? that is probably my favorite vocal performance of the 14 tracks offered. However, in true Cee Lo fashion there are some fun additions like Run Rudolph Run that you'll be singing long after the song is over and You're A Mean One, Mr. Grinch that will have you lost in visions of sugarplums childhood memories. There are a couple of features on this album, too, with Christina Aguilera chiming in on Baby It's Cold Outside and Rod Stewart on Merry Christmas, Baby. Yet the star of the album belongs to All I Need Is Love with the Muppets. It's upbeat. It's fun. [Given the recent events of last week, the message couldn't be more appropriate.] See for yourself below (or here). Cee Lo also takes on All I Want For Christmas by Mariah Carey... maybe I'm partial to the original version, but Cee Lo gets an A for effort. Overall, it's a fun addition to the standards offered at this time of year. If you're looking for a few songs to add to your collection, I would suggest Run Rudolph Run and Mary, Did You Know? with All I Need Is Love or What Christmas Means To Me if you have room. Check out my other Christmas music recommendations here and be sure to let me know what you're listening to this time of year! My parents thought it was just a phase I would grow out of, but year after year and album after album they would purchase the music to feed my musical addiction. Mariah's voice was (and kind of still is) my drug. She could do no wrong vocally and I listened to every song (and every remix) of every album until the release of the next one and the cycle repeated. 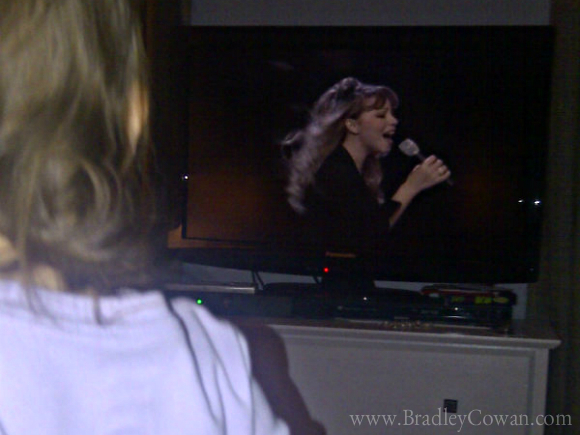 Sure folks thought it was a little weird, and probably still do, but in time everyone accepts it as just a fact... Brad's favorite singer is Mariah Carey. There's something about the tone of her voice that fills me up, it's really hard to explain. She has this calming ability yet she's inspiring and motivational at the same time, and that's all in one song (i.e. Fly Like a Bird). From the warm, velvet tone in Melt Away and Babydoll to the passionate, full chest voice of Anytime You Need A Friend and Stay The Night to the understated whisper of Lullaby and the sarcastic wit in Touch My Body or Clown or Standing O or even Thanx 4 Nothin' (google that one!) to the heart of My All and We Belong Together and the energy of Heartbreaker or Shake It Off or Migrate to the soul of If It's Over and Vanishing and Mine Again and Inseparable even throwing around those high notes in Emotions and Bliss... Mariah can do it all and, arguably, she's the only one that can. Now that I'm a grown man and married - Allison likes her, too, but clearly not on the same level and no that wasn't a requirement when dating - I try to keep the Mariah fascination at bay except that I've posted about her here, here, here, here, here and here. Honestly, I'll probably post about her again. I've been a fan (or unofficially #lambily if any other fans happen to read this) since the beginning of her career and have such an appreciation for her voice and overall talent that I can't imagine the world of music without MC. Actually you can't even form the word music without MC... so the proof is in the pudding spelling. I've never had the privilege of hearing her in person/concert since she rarely comes to North Carolina, but there will come a day. Mariah... if you're reading this (yeah right) only you can make it happen! Meanwhile, I've slowly been introducing Madison to the voice and she seems to share the same appreciation I do. She's even tried a few high notes of her own. That's my girl! Whether you're a for-life-fan like me or not, there's no denying Mariah Carey practically invented singing (or reinvented it at the very least) and I'm sure everyone has a certain MC song they're jamming to... it's okay to admit it. I debated for a while if I should post this or not, because it makes me look crazy, but ultimately I decided that everyone probably has a secret musical obsession and/or guilty pleasure of their own so why not put mine out there? I ain't skurred. Plus anyone that knows me already knows this little detail and would not find this post surprising at all. I'm just... in the words of the late ODB... keeping it real, son. It's cold outside and the fireplace is going (well at least in some places where applicable)... the only other thing needed is a good Christmas movie on the TV to watch while curled up on the couch. 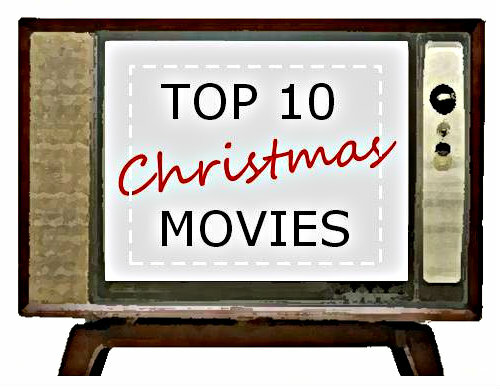 So grab your favorite blanket and a glass of eggnog (or wine or hot chocolate or winter beverage of your choice) while I count down my favorite Christmas flicks. These are my favorites so I'm sure not everyone will agree with the rankings! 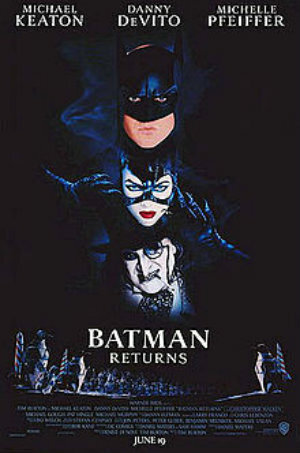 Batman Returns - I guess this is more of an alternate (according to my wife, it doesn't even qualify)... but I love it. 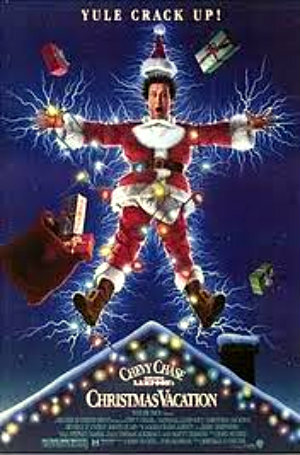 Technically it's not a Christmas movie, but it does take place during Christmas. What? It counts! Given my like of the Batman franchise, this really shouldn't be a surprise. 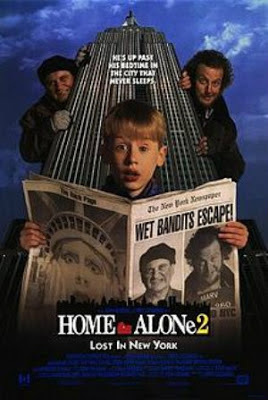 Home Alone 2: Lost in New York - While not as great as the first (not many sequels are), it still capitalizes on the magic of its predecessor. However, if not for Macaulay Culkin, it would have crashed and burned... which is why the third effort is no where on this list. The Santa Clause - Tim Allen takes on Christmas with a family friendly explanation of the importance of Santa in a child's life/imagination. I loved this movie growing up and find I'm still drawn to it even as an adult. How the Grinch Stole Christmas! - Both the animated original and the remake starring Jim Carrey are good; I like them for completely different reasons. 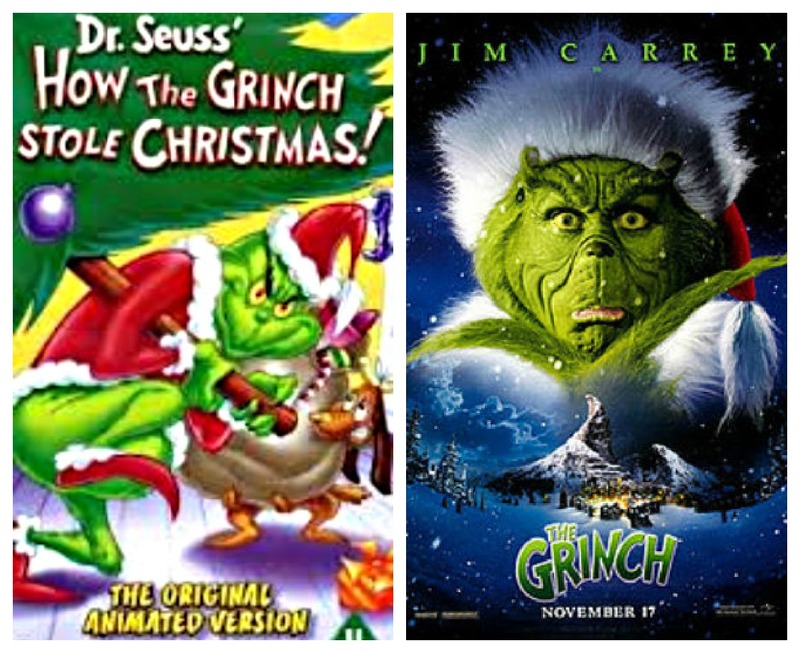 It's hard to imagine getting through a single Christmas season without one Grinch reference in some form or another. Miracle on 34th Street - It's such a classic Christmas movie. Who doesn't enjoy this one? A Charlie Brown Christmas - Another classic that everyone, regardless of age, can enjoy. It's fun and the epitome of a great Christmas cartoon. 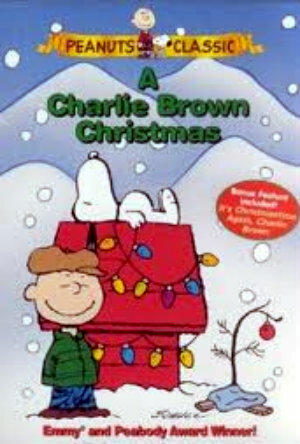 Plus who hasn't had a Charlie Brown Christmas tree at some point? I have... 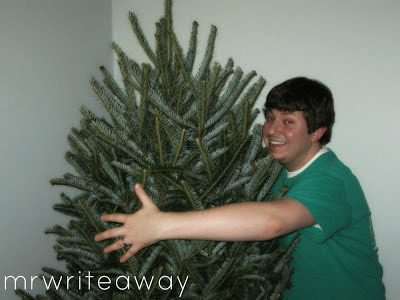 I was 19 at my first apartment... that tree was pitiful. 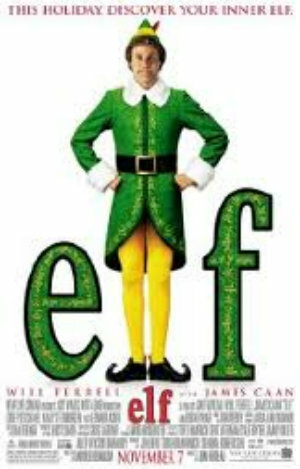 Elf - Hands down Will Ferrell's most hilarious role. I can't get enough of this movie! National Lampoon's Christmas Vacation - Funny. Smart. Witty. This movie is probably one of the greatest movies of all time as far as comedies go and I don't see how anyone couldn't enjoy themselves at the Griswold's expense. The charades are endless and so are the Christmas lights. 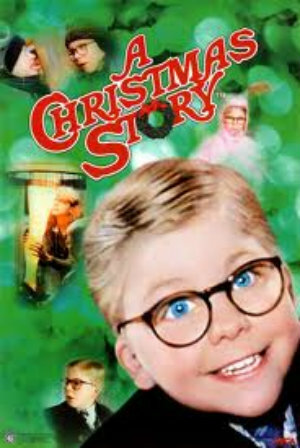 A Christmas Story - Traditionally the one movie I have on a constant loop Christmas day. My mother absolutely cannot stand it, which may contribute a little to why I liked it so much as a kid. Regardless, it's really good. From the leg lamp to the bunny costume to the "shoot your eye out" catchphrase... 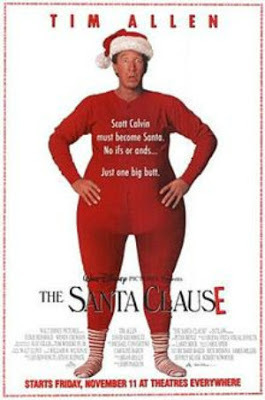 I can't go a single Christmas without watching this movie at least once. Admit it, you've either tried or dared someone to try sticking their tongue to a frozen pole. 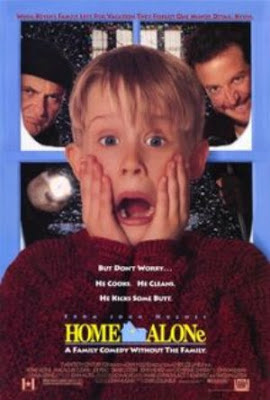 Home Alone - Maybe I'm alone on this one, no pun intended, but this movie screams Christmas! Macaulay Culkin at his best as the hero every child wishes to be. The music score is among the greatest for any movie ever; John Williams was a genius on this film. The antics and obstacles are the definition of entertainment. In fact, I think I'm throwing this one on the tube this weekend. There's two Christmas albums that everyone should own... this one and Aaron Neville's Soulful Christmas. There's something about Mr. Neville's voice that is comforting like a bowl of chicken noodle soup or warm like a mug of hot chocolate. 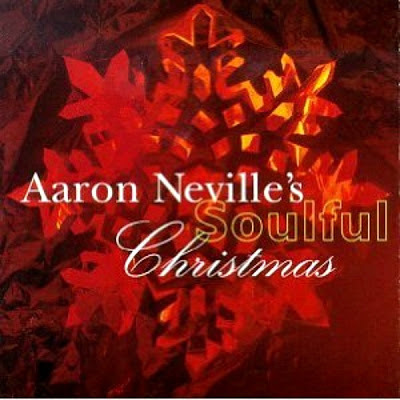 His Christmas album makes a house a home from the beginning to the end and the saxophone-like tone of his voice will have you hooked immediately. Get the fireplace going, wrap some presents with an old Christmas cartoon on in the background and drink some eggnog while allowing the songs from this album to be your soundtrack. You won't regret it. The stand outs for me are Please Come Home For Christmas, Louisiana Christmas Day, and Such A Night. Grab a copy today, if you don't own it already. 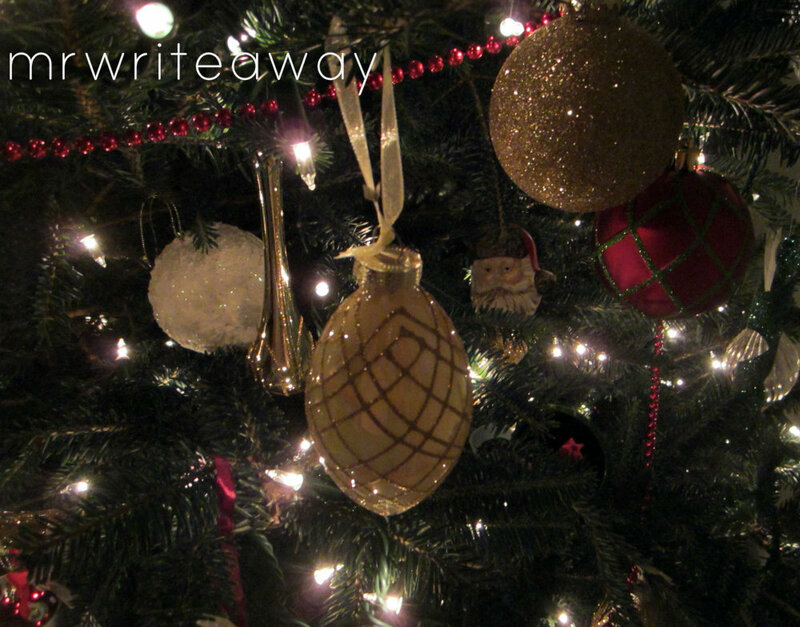 I can't believe Christmas is only 15 days away! This year flew by. ...a watering spout for your Christmas tree. Stop! Where was this thing last year? If it's been around forever and I didn't know about it, I'm pissed sad. Here's a brief back story - I grew up with an artificial tree - every year we'd pull out the box from the attic and color code the branches into piles then place each one in its designated row until the entire tree was assembled. Done! String some lights and hang some ornaments and there wasn't any maintenance to be had until it was time to take the tree down. I was always a little (only a little) jealous of others that had a live tree in their living rooms. Real trees are so full and... real. Last Christmas was Madison's first Christmas and the first Christmas in our new house (it was technically the second since we moved in on Christmas Eve the year before, but there wasn't a tree or stockings so it doesn't count) and we wanted to start our own traditions - one being a live tree. 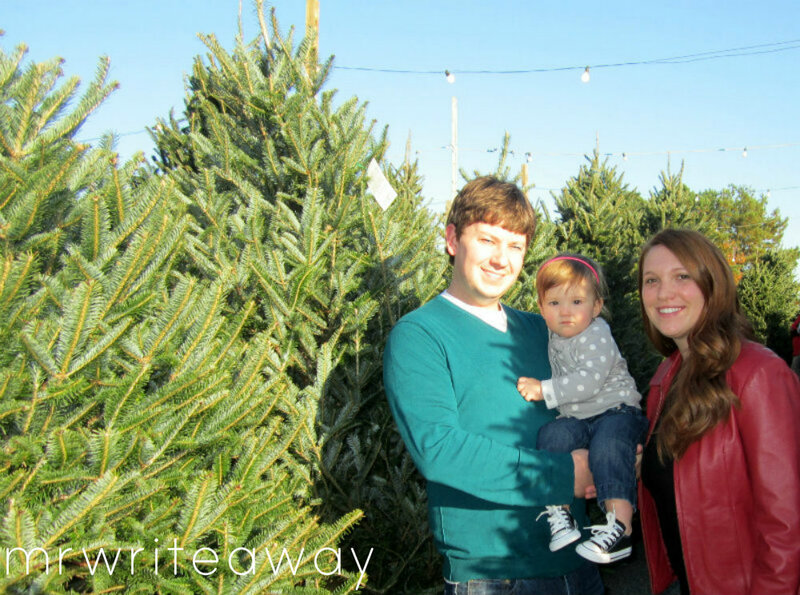 Allison grew up with a live tree and explained to me there are two kinds of people in the world: real tree people and artificial tree people. So I had to make a decision! We bundled Madison up and headed to the tree lot. Then came time to water it. Every. Single. Day. My level of love slowly started to sink to a level of like as I began to hate crawling under this tree with a pitcher of water every afternoon. 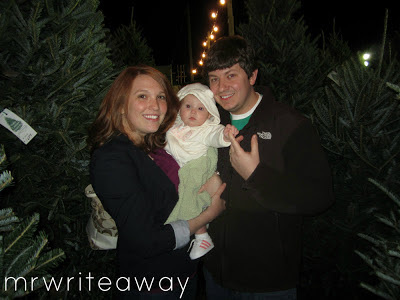 However, watering aside the live tree was beautiful and I really was sold on the idea and uttered the words to my wife that every woman yearns to hear... you're right. Fast Forward to this year and we went tree hunting during the day..
...and my parents mentioned a watering spout they saw at Lowe's that made them think of us. After they explained how it worked (I'm a visual person and needed more details) the wife and I made a point to swing by the store to get one. And get one we did... the very last one. Sorry to anyone that came in after us! 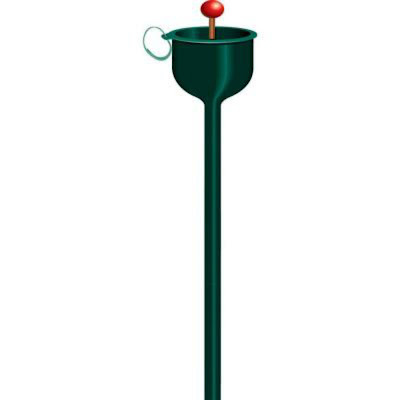 This spout really is a must have for anyone with a live tree. The gist is you stick the spout down through the tree all the way into the base then you pour water in the cup-like end and let it run down into the base. There's a dipstick to check the water level, as well, so you know what the water situation is without having to move the presents and crawl under there to check. Genius! Plus it's not an eyesore, you just tuck it down into the tree in an area that's easy to get to for watering but not obvious to anyone admiring your ornaments. Like I said, we got ours at Lowe's but they can be found anywhere (here or here for example)... get one for yourself. I insist! Unless of course crawling around under trees is your thing, in which case keep doing you. Last year, we added Christmas by Michael Bublé to our holiday collection and find it in rotation again this season. I'll be honest... not every track on this album is great, but they are pretty good and definitely worth a listen. Michael's voice lends itself to Christmas music effortlessly, almost as if he were intended to sing these types of songs all along. It's Beginning to Look a Lot Like Christmas starts the album off perfectly with a throwback to the classic, traditional feel of Christmas. Santa Claus is Coming to Town has a similar tone, but Jingle Bells featuring the Puppini Sisters (I've never heard of them until now and I like them) is a stand out. It's my favorite from the album... the big band arrangement will have you tapping your foot or singing along or both by the chorus. White Christmas starts off great, but then Shania Twain chimes in and I lose focus. The wife likes it though. Personally, I just like the duh duh da dum... duh duh... duh da duh. To each their own, right? Next, Michael tries to cover the greatest Christmas song of the last decade... Mariah Carey's All I Want For Christmas Is You. While I would never encourage anyone to attempt a cover of any of Mariah's songs (she's an alien and her voice is ridiculous), this particular cover is the best effort of this tune that I've heard. I'm not sure if it was Michael's idea (or David Foster's) but it was genius to slow it down so that it's almost unrecognizable and therefore not comparable to the original. Still though, Mariah is a beast and it goes without saying her version is the one to choose if forced to pick between the two. 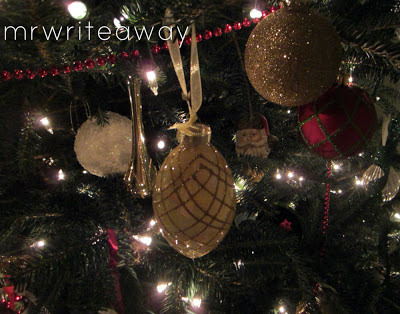 There are other tracks in the lane of the first traditional few like Holly Jolly Christmas, Have Yourself a Merry Little Christmas, and Silent Night that all aim to please the seasonal lover in all of us. Yet for some reason he chose to do Santa Baby, but changed the lyric to "Santa buddy" -- I don't get it. Some people may like it. I don't. 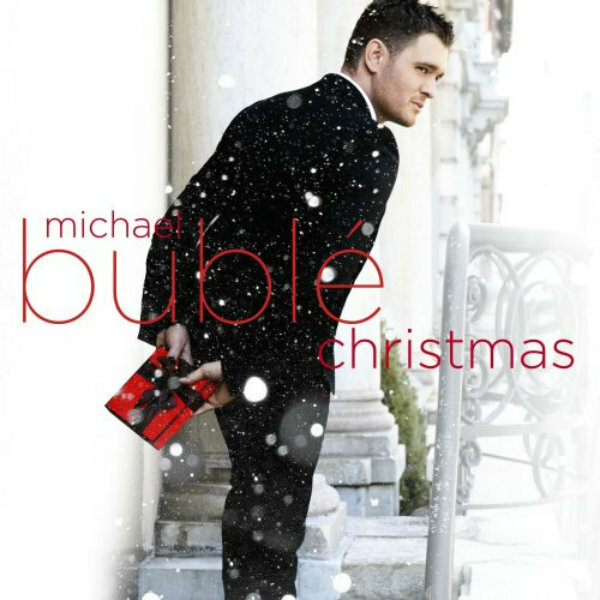 Overall, it's a decent Christmas album and worth a shot if you've never listened to it. If you're looking for a song or two to add to your holiday playlist, go for It's Beginning to Look a Lot Like Christmas and Jingle Bells... you can't go wrong.